New dimension consisting of large caves. 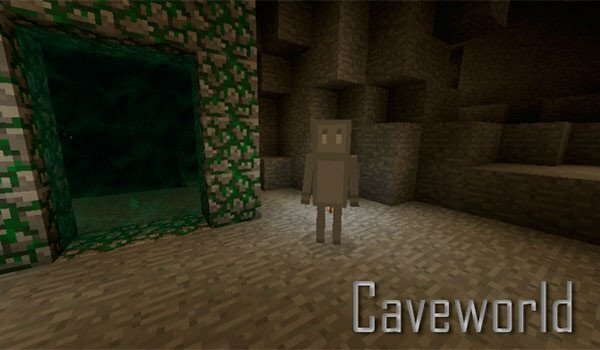 Caveworld 1.7.10 is to mod that allows us access to a new dimension, named “caveworld”. In this new dimension we will find an underground world, made ​​up of large caves that have no access to the outside, that is, it is the perfect size for miners Minecraft. The rate of occurrence of minerals In this dimension is higher than in the basement of the ordinary world of Minecraft. To access the dimension must create a portal with mossy stone and then put a Ender chest inside. Once inside mine win points that will help us to get the mob added by this mod, called “Caveman ” is our partner. This appears to be itching, and we make it our friend using 1000 mining points. ¡A new dimension formed solely by large caves!